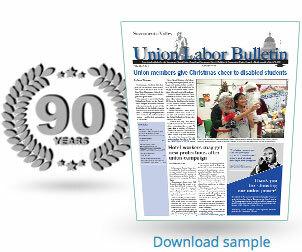 The Sacramento Valley Union Labor Bulletin welcomes new subscriptions and readers. Individuals may subscribe for just $20 per year, while our group rate is an affordable $9.60 per subscription/year (or $.80 per month). To subscribe, call us at (916) 646-4007 or e-mail us at laborbulletin@gmail.com. It’s never been a better time to advertise in the Sacramento Valley Union Labor Bulletin. This monthly newspaper goes directly to union and community members’ homes, which can mean increased customers frequenting your business. Please call the Labor Bulletin office to inquire about advertising in the upcoming editions. We’d love to talk to you about what the Labor Bulletin can offer. Call Sunnie Rose, sunnie@saclaborbulletin.com, 661-496-6022. Camera-ready copy (ads that are typeset, sized according to specifications and saved as a PDF with fonts embedded) are preferred. However, if you would like to place an ad and need one created, the Labor Bulletin office can provide that service for a minimum charge of $65 per hour. Estimates are available. Ad reservations are due the first working day of each month. Ad copy is due by noon Monday 10 days before publication, earlier if possible.